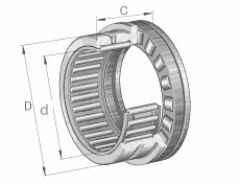 These bearings do not have an inner ring and are therefore particularly compact in a radial direction. However, they require a shaft raceway that is hardened and ground. Series NKXR and NKXR..-Z have an axial bearing component comprising a roller and cage assembly with a plastic cage. NKXR..-Z also has an end cap on the axial bearing component. NKXR is lubricated with oil. NKXR..-Z is intended for grease lubrication. The axial bearing component is greased using a lithium complex soap grease to GA08. The end cap does not have lubrication holes.